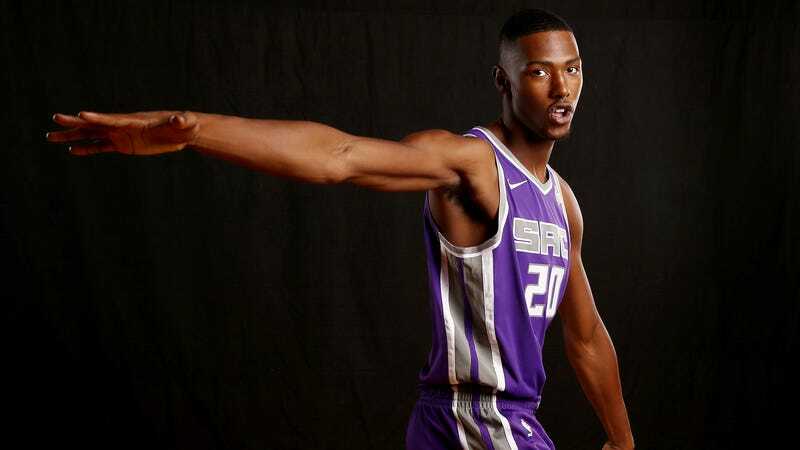 Bleacher Report published a profile of Sacramento Kings center Harry Giles that opened with the most hackneyed profile technique of all time: the subject eating. This particular eating scene, however, also included 300 words of what amounted to a kind of press release about the company that makes the food. This kind of stealth quasi-sponsored content isn’t unique in sports media today, but usually the brand plug at least makes the brand look good. On the afternoon after making his NBA debut, Harry Giles is in line at a trendy Sacramento dessert shop called CREAM. The concept here is that ice cream alone isn’t sweet enough, and that it’s better served sandwiched between pastries such as cookies, donuts or waffles. Giles posterizes the bland snickerdoodle cookie and churro ice cream concoction I order with his choice: a waffle sandwich with strawberry ice cream dipped in fruity pebbles. So far, sponcon on track: reading like an investor pitch, including some order options, mentioning specific flavors. Check. He grabs a bottled drink from the fridge and then folds himself into a far-too-small barstool next to the store’s owner, Zayn Silmi. A few months back, Silmi—who runs a Sacramento lifestyle blog and is friends with several Kings players—offered to name a sandwich item after Giles. Since then, Giles has been munching through the menu, trying to find the combination capable of carrying his name. A few minutes pass before Silmi gets up to investigate why Giles’ order has not yet arrived. Silmi comes back not only with news, but with a metaphor fitting for Giles’ basketball career. His order had been delayed because Giles’ waffle had broken in the griddle not once, not twice…but three times. Food falling apart! Two quick paragraphs of background information on Giles and it’s back to the ice cream place, but, uh-oh! At CREAM, Giles realizes the waffles aren’t going to work and decides to make due with birthday cake cookies instead. He flashes his signature bright smile for Silmi’s Instagram, then swivels off the stool and continues eating on the way out of the shop. Outside in his Porsche, he confesses that this isn’t the sandwich he’s been searching for. It’s good, but he is after something more. As in his quest to return to the basketball court, he won’t quit until he finds himself. Basketball is like ice cream sandwiches, you see, and Harry Giles, because he has been eating a lot of ice cream sandwiches in order to find the one he likes the most, will obviously never give up on his dream of being a basketball star. So, after 300 words of muddled cliches and tortured sponcon for a brand that may or may not have some sort of official sponsorship with the Sacramento Kings (a story about Marvin Bagley III on the Kings’ official website featured a suspiciously similar opening scene of Bagley “perch[ing] his lanky, 6-foot-11 frame inside CREAM, a local ice cream sandwich shop in the Howe ‘Bout Arden retail center, sharing frozen treats and vibrant laughs with future Kings teammates De’Aaron Fox and Harry Giles,” and this Instagram video posted by the Sacramento CREAM franchise featured Kings players and declared that it was the “preferred dessert of the @sacramentokings”), what do we know? We know that Bleacher Report is doing, or trying to do—wittingly or not—PR for an ice cream shop because some of the Kings players are friends with the low-level Instagram influencer guy who owns it, or that the Kings have some kind of deal with CREAM (it isn’t listed on the team’s official partners page), and Bleacher Report didn’t disclose this fact in the story. If it’s the latter, that’s malpractice; if it’s the former, there are better ways to humanize a subject that don’t include becoming an unsuccessful brand bot for some random ice cream chain and trying to cram deep meaning into an interaction that has none.